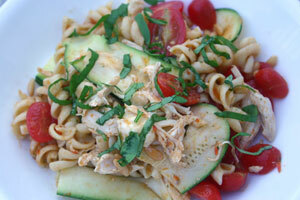 Having you been avoiding pasta salad because you think it has too many carbs? While most versions do, if you make your own, you can control the amount of carbs and fat. Just cut back on the pasta and load up on vegetables, which is easy to do at this time of the year. Throw in shredded chicken for additional protein and a touch of fresh mozzarella for a boost of calcium and you have a healthy, make-ahead meal that is perfect for lunch, dinner or a picnic. I love the idea of combining the dressing and pasta before adding the other ingredients. The pasta absorbs most of the liquid and you aren’t left with an oily mess at the bottom of the bowl. While you could use rotisserie chicken from your local market instead of cooking it yourself, you’d be missing out. Boiling the pasta in the resulting chicken broth gives it a depth of flavor that really adds to the dish. I was lucky enough to have some flavored olive oils in my pantry, so I made use of them. If you aren’t so lucky, just use all extra virgin olive oil instead (about 1/3 cup total). Note the pine nuts should be toasted. Put them in a small dry skillet over medium-high heat and toss them around until they get brown in spots. You might want to do this before you start the recipe. Make It Vegetarian: Skip the chicken and cook the pasta in water or vegetable stock. What do you like to put in pasta salad? Make the dressing: Add whole garlic clove to running food processor. Turn off processor and add tomatoes, vinegar and basil. Purée until smooth. Combine the three olive oils in measuring cup. With the processor running, add the olive oil mixture in a steady stream. Blend until smooth, then season with salt and pepper. Cook the chicken and pasta: Combine chicken, onion, celery and carrot in small stock pot. Add water to cover and bring to a boil. Reduce heat and cook, partially covered, for about 30 minutes. (I usually cook 3 or 4 breasts, then save the others for meals later in the week.) Turn off the heat and let cool (in the broth) for about 15 minutes. Remove the chicken to a cutting board and strain the broth. Discard vegetables. Return the broth to the same pan, then bring it to a boil over high heat. Cook pasta in the broth according to package directions. Drain in a colander. Put the salad together: Place pasta in a large bowl and toss with dressing. 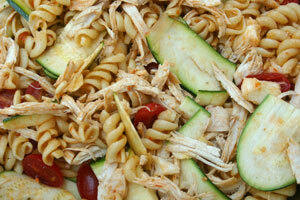 Remove skin and bones from chicken; shred meat and add to bowl with pasta. Thinly slice the zucchini with a mandoline or vegetable peeler; cut strips in half crosswise and add to bowl with pasta. Add the tomatoes, mozzarella and pine nuts; toss well. If serving immediately, add the basil and season with pepper. If making ahead, refrigerate the salad and add the basil and pepper just before serving. Nutritional Analysis: This pasta salad is a good source of Vitamin A, Vitamin C, Calcium and Iron. If I wanted to reduce the amount of fat, I would use less chicken and/or mozzarella. The dressing sounds perfect. Can’t wait to try this recipe.